Free Printable Hot Wheels Word Search. Free Printable Hot Wheels Word Search activity for your kids. A fun activity for all the Hot Wheels fans of animated TV series, Hot Wheels cars and tracks, Hot Wheels movies. You can print and give this activity to your friends, students, parents, neighbors and teachers. Great for a Hot Wheels themed birthday party celebration. Search for fastest Hot Wheels cars and related words like Power Boosters, Garage, Collector, Ballistik, Fan Man, Muscle Mania, Play, Race, Clear Speeder, Then and Now, Star Wars, Monster Jam and more. This easy word search includes 16 Hot Wheels words and the answers on page 2. 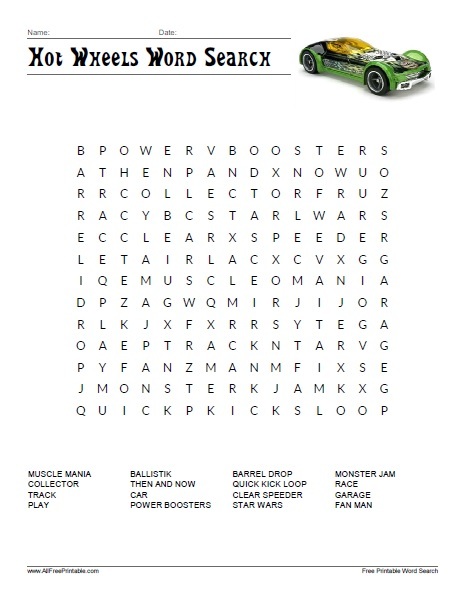 The Hot Wheels Word Search Puzzle is ready to print in PDF format.